People in modern Western cultures are driven by the quest to be exceptional to generate feelings of self-worth. Self-esteem refers to our perceived value, sense of self-worth or how much we like and respect ourselves. Self-esteem is often determined by our uniqueness and difference from others and how special we are as individuals. In the US and other countries there is a strong focus on building self-esteem as a way of overcoming depression and negative feelings. However this reliance on showing a difference and being exceptional can be counter-productive because, quite frankly, most of us are average and not distinctive. It is simply not possible for everyone to be exceptional and well above average, at the same time. While there may be some things unique and exceptional about us, there is always someone who is better and things change. To develop self-esteem we tend to pump up our own egos and pull down the ego of others so that we can feel good about ourselves in comparison. But this strategy of needing to find a difference can be very negative, as it can makes us aware of our failings, mistakes and under achievements. We can become the victims of our own self-judgment and of our low self-esteem. Unlike self-esteem, the benefits of self-compassion do not depend on you feeling you are special in some way, above average, or have met expectations. Rather, they come from caring and being compassionate about ourselves. Instead of playing the endless game of competition, we engage with what we share with others, and benefit from this sharing. The benefits of self-compassion in helping us to feel good about ourselves, do not disappear when things go wrong or we make mistakes. On the contrary self-compassion steps in whenever we feel inadequate, fail or make errors, precisely when our self-esteem would be destroyed leaving us vulnerable and damaged. Of course, self-esteem and self-compassion are correlated and do tend to go together. If you are self-compassionate, you will probably also have higher self-esteem because you will be less critical of yourself. Similar to high self-esteem, self-compassion leads to much less anxiety and depression. It also leads to optimism, more happiness and more positive emotions. However, self-compassion trumps self-esteem when things go wrong, you make mistakes or your ego is threatened in some way. 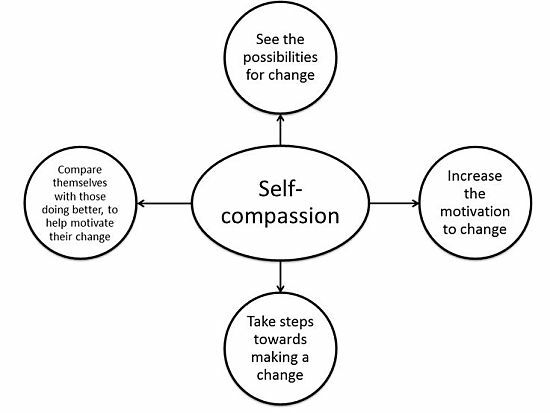 Self-compassion also stimulates your desire to make changes in your life which would be impossible if you regard yourself as worthless or unacceptable. Mindfulness is being actively aware of despair, confusion, feelings of inadequacy and other forms of stress. Self-compassion means acting the same way towards yourself, when you are having a hard time, suffer a failure, or become aware of your own inadequacy, as when you show compassion for others in similar circumstances. Having self-compassion means that you honour, respect and accept your humanness that is shared with everyone else. Self-compassion is simply a natural, healthy response to feeling bad and coping with it. Mindful self-compassion means instead of ignoring your pain or anxiety or stoically resisting it, you act proactively by finding ways for comforting and caring for yourself. It means responding with understanding and kindness, applying self-compassion to various emotions that you are aware of, including fear, sadness, shame, anger and self-doubt. It means stopping self-judgement and not labelling ourselves as 'bad' or 'good'. It means accepting ourselves as we are, and treating ourselves with the same compassion as we would offer to a close friend. It is derived form Buddhist concepts of the importance of compassion, including compassion for yourself. The principle is that you should care about yourself so that you can fully care about other people. Mindful self-compassion can be adopted and learnt as a discipline by anyone by learning to apply good will towards self. When we start to meditate or work with any kind of spiritual discipline, we often think that somehow we're going to improve, BUT this is a subtle aggression against who we really are. "If I jog, I'll be a much better person." "If I had a nicer house, I'd be a better person." "If I could meditate and calm down, I'd be a better person." "If it weren't for my partner, I'd have the perfect marriage." "If it weren't for the fact that my boss and I can't get on, my job would be just great." "If it weren't for my mind, my meditation would be excellent." But loving-kindness — maitri — toward ourselves doesn't mean getting rid of anything. we can still be timid and full of feelings of unworthiness. 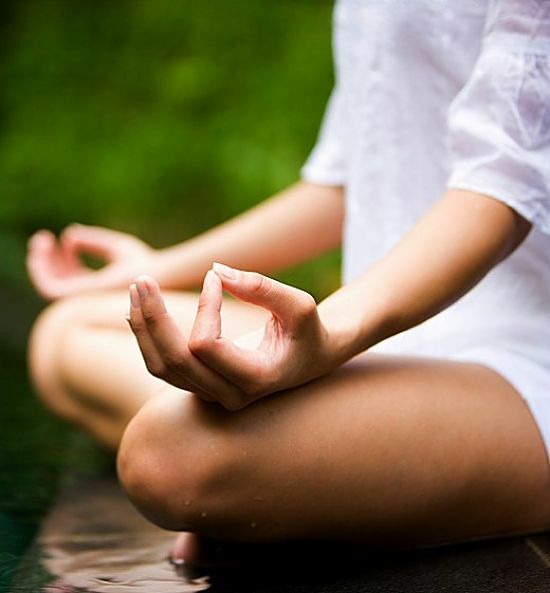 Meditation practice is not about trying to throw ourselves away and become something better. It is about befriending who we are already. The foundation for the practice is you or me or whoever we are right now, just as we are. Curiosity involves being gentle, precise, open — actually being able to let go and open. Gentleness is a sense of good heartedness toward ourselves. Precision is being able to see clearly, seeing what's really there. 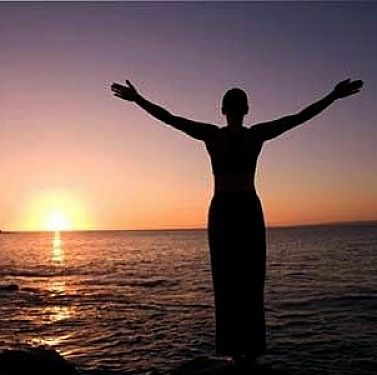 Openness is being able to let go, and open. When you come to have this kind of honesty, gentleness, and good-heartedness, combined with clarity about yourself, there's no obstacle to feeling loving kindness for yourself, and others as well. "'WE ALREADY HAVE everything we need. There is no need for self-improvement. All these trips that we lay on ourselves—the heavy-duty fearing that we're bad and hoping that we're good, the identities that we so dearly cling to, the rage, the jealousy and the addictions of all kinds—never touch our basic wealth. They are like clouds that temporarily block the sun. But all the time our warmth and brilliance are right here. This is who we really are. We are one blink of an eye away from being fully awake." "Life is glorious, but life is also wretched. It is both. Appreciating the gloriousness inspires us, encourages us, cheers us up, gives us a bigger perspective, energizes us. We feel connected. But if that's all that's happening, we get arrogant and start to look down on others, and there is a sense of making ourselves a big deal and being really serious about it, wanting it to be like that forever. The gloriousness becomes tinged by craving and addiction. On the other hand, wretchedness--life's painful aspect--softens us up considerably. Knowing pain is a very important ingredient of being there for another person. When you are feeling a lot of grief, you can look right into somebody's eyes because you feel you haven't got anything to lose--you're just there. The wretchedness humbles us and softens us, but if we were only wretched, we would all just go down the tubes. We'd be so depressed, discouraged, and hopeless that we wouldn't have enough energy to eat an apple. Gloriousness and wretchedness need each other. One inspires us, the other softens us. They go together." 1. Self-kindness - Self-compassion means being warm, kind and understanding when we feel inadequate, suffer or fail in some way, rather than punishing ourselves with self-judgement and self-criticism. Failing, falling short of ideals, being imperfect and having problems in life is inevitable, and requires kindness, understanding and gentleness. 2. Universal humanity - All humans suffer, have problems, difficulties and imperfections. Self-compassion means recognizing that personal inadequacy and problems are part of the shared human experience and can be triggered by external factors. Recognizing that we are all interdependent means we can share life's failings and difficulties. It also means we can be less judgemental with ourselves and less personal in attributing blame. 3. Mindfulness - Mindfulness is a receptive, aware and non-judgmental mental state which embraces all or our real thoughts and feelings without trying to deny of suppress them. We can only feel compassion if we recognise our pain and acknowledge our own weaknesses and imperfections. Ignoring our flaws, suppressing our negative feelings, or blaming someone else for our problems, may provide temporary relief. But confronting the issues and recognising them as soon as they occur is better than 'bottling them up' and getting stuck in endless cycles of conflict and stagnation. When people pity themselves, they start to drown alone in the mire of their own difficulties and don't recognise that other people have similar problems. They fail to see that we are all interconnected and that we don't have to deal with things alone and by ourselves. Self-pity leads to a sense of isolation which magnifies personal suffering and pain. Self-compassion, on the other hand, allows you to share your experiences to a common shatred problem and reduces the feelings of isolation and disconnection. Being self-compassionate means that you want to cope with your problems and be happy and healthy in the long term. Being self-focused and self-indulgent leads to many problems especially when we blame ourselves for what has happened or blame our inadequacies and imperfections. Where there is 'no pain there is no gain' and making changes to improve your health and well being requires effort, pain and displeasure. Being self-indulgent puts blinkers on our awareness of what we need to do to make changes (requiring a panoramic view). Although self-compassion and self-esteem are closely related there are several important differences. Self-esteem describes our perceived sense of our own value, our sense of self-worth and how much we like ourselves. In modern Western societies, self-esteem can only be demonstrated by showing our uniqueness and difference from others. We must stand out from the crowd and be special in some way. On the other hand, self-compassion is not based on self-evaluations or self-judgement compared with other people. All human beings, including ourselves, deserve compassion and understanding. This means that you don’t have to feel you are 'better than the pack' to have self respect and good feelings towards yourself. Self-compassion also means that we acknowledge our failings and deal with them in a kind and compassionate way avoiding the need to hide our failing to protect our need to be superior in some way. Also self-compassion isn't at risk from external circumstances, it can always be applied when things change or problems occur. In contrast our self-esteem is always at risk and vulnerable to circumstances and can be brought undone so easily though of bout of self-judgement.